Bold pieces, bright colors and classic lines! Make a bold statement with the season’s trendy looks. This outfit will carry well from work to running errands. Embellish with Shopanthropic’s ethically-made Recycled Bullet Pendant, Recycled Bomb Shell Bangle bracelet, and Indian silk scarf. Work basics and classic lines! You mean business with this look! This outfit will carry well from work to evening drinks. Embellish with Shopanthropic’s ethically-made Recycled Bullet Pendant, Recycled Bomb Shell Bangle bracelet, and Bhagalpur Silk Stole. Bold pieces, bright colors and classic lines! Make a bold statement with the season’s trendy looks. This outfit will carry well from work to evening drinks. Embellish with Shopanthropic’s ethically-made Recycled Bullet Pendant and Recycled Bomb Shell Bangle bracelet. So Halloween is coming up; the last exciting celebration of the year before the Christmas holidays. The anticipation of developing a sugar rush builds, but the guilt of a) consuming candies and ruining your diet or b) paying a rich hydro bill from all those Halloween decorations, suddenly gets you pondering: What do you do now? There is no better way to enjoy a guilt free Halloween than going eco-friendly. 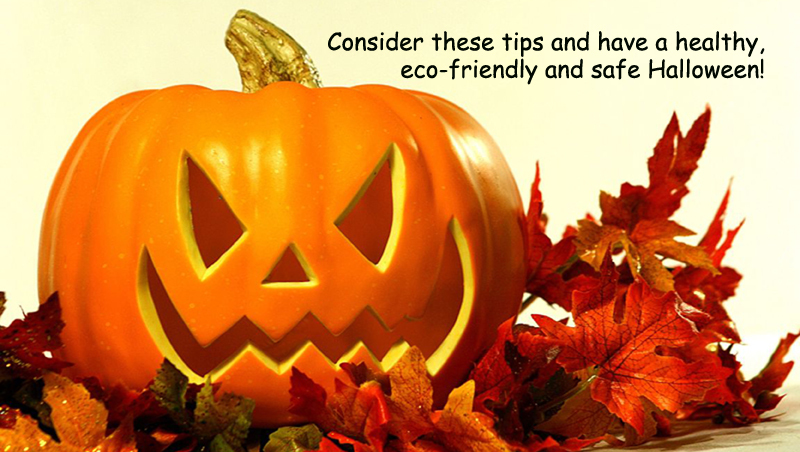 Here are some tips for having a spooky eco-friendly Halloween! 1. OLD CLOTHES- You know those old clothes that have been hiding in your closet? Why not bring out the little designer devil inside of you and create your own Halloween costume this year. Not only will you be re-using old clothes that you’ve totally forgotten about; you will also be saving some loose change. 2. PARAFFIN IS EVIL – Instead of burning cheap paraffin candles that are bad for the environment and atmosphere you breathe in, try making your own candles from eco-friendly materials. One of the most popular home-made candles are made from beeswax sheets! There are tons of instructions on the web, so get your fingers on that keyboard! 3. PUMPKINS ARE HEALTHY FOR YOU – Did you know that the minerals found in pumpkin can prevent pre-mature aging and certain types of cancers? Instead of saving all the pumpkin seeds for your garden, why not head out to your nearest health food store for a big bag of pumpkin seeds and make homemade pumpkin seed goodies for the kids! There are dozens of mouth-watering pumpkin seed recipes out there – it’s a must try! 4. ORGANIC BRANDS- If you’re a busy mom, parent or homeowner and cooking is just not for you, then no need to worry! Believe it or not, there are amazing brands selling healthy yummy organic goodies! You are bound to get that “taste good, feel great” effect! 5. GO SOLAR- One of the best things you can do for your electricity bill on Halloween night is to dress your yard with solar powered yard lights. These lights charge during the day and automatically turn on at night. A major benefit is that they can be re-used after Halloween for almost any outdoor event you host at your residence. The Guardian had a live discussion with a panel of experts on how to make sustainable living a part of a mainstream lifestyle by making it “easy, normal and fun”. Fair Trade USA’s recent decision to allow corporate coffee exporters to become certified under their brand has caused an uproar in the fair trade community. This move towards encouraging corporate interests is considered a “stab in the back” to many smaller importers and roasters, an abandonment of the principles that make the certifying body valid. In the end of the day, Fair Trade USA is a business, and like every business – it has to consider its bottom line, in addition to its principles and morals. By allowing the likes of Starbucks and Green Mountain Coffee to become certified, Fair Trade USA made a whole lot of profit. Just as any other for-profit social enterprise, Fair Trade USA can use these profits to further create social change by using the economy to fund “good” coffee plantations? So how do we fix this issue? Should fair trade certifiers be clearer and more rigid with their standards? Should corporations be allowed to join the fair trade movement? How do we really know who is making the best impact? 26% of executives admit to sleeping with their smart phone. 75% of Americans admit to using their cell phone while in the bathroom. According to the GSM Association (the world’s leading body of mobile operators and device makers), mobile industry revenues are expected to rise to $1.9 trillion in 2015. Cell phones are a big industry that impacts all of our lives and depending on who you talk to, this impact can be a positive or a negative. Yet our complaints about a lack of communication skills in the “smart phone generation” and using cell phones at the table seem petty compared to the slavery, exploitation, and pollution involved in the production of the cell phones we use. As we become more concerned with the impact our consumerism has on the environment, the race is on for the world’s first Fairtrade certified phone. Naturally, some big contenders come into mind for who could produce this phone and one of them is Apple, who recently announced their intent to be the first tech company to join the Fair Labor Association (FLA). This action would be a huge step for the fair trade movement as many companies would fully suit in attaining such certifications. However, another smaller company, Fairphone, is creating waves in this area. Fairphone’s goal is to create a cellphone that is made entirely of parts produced and utilized without harming individuals or the environment. The world’s first fully environmentally-friendly and socially-conscious cell phone. While Apple might have the technology and capabilities to create an incredible phone, Fairphone seems to be clearer on what their goals are with this project. However, if Apple is to succeed in creating the first Fairtrade phone it will be a remarkable step in encouraging other companies to follow the behemoth down this path to sustainability. An investigation by BBC’s Watchdog programme outlined how currently leading manufacturers such as Nestlé, Cadbury and Mars are allowed to mix up the Fairtrade beans with others from non trade sources, and yet still label the finished product as Fairtrade. As October is Fair Trade Month, we found this interesting article on the impact of fair trade on local culture. … Over the past year, author Kelsey Timmerman has traveled around the world meeting the people who catch, pick, and grow our food while conducting research for his upcoming book, WHERE AM I EATING? AN ADVENTURE THROUGH THE GLOBAL FOOD ECONOMY. During his travels, Kelsey met farmers whose lives have been deeply impacted by Fair Trade. Read the full article here: http://www.triplepundit.com/2012/10/fair-trade-lives-preserve-culture-2/. Could improving the working conditions of labourers in developing countries create new markets and stimulate world economic growth? The Obama administration believes that a new partnership with eight Pacific Rim countries, the Trans-Pacific Partnership (TPP), will promote trade and investment. Currently the TPP consists of Australia, Chile, Brunei, Malaysia, New Zealand, Peru, Singapore, and Vietnam, and if these negotiations go through then they will include other Pacific Rim countries. Yet based on empirical evidence from other free trade agreements, such agreements do little for workers and businesses in all partner countries. Out of the 14 free trade agreements the US has, there is no clear evidence whether these agreements, such as NAFTA, has created or eliminated jobs. The goal of such agreement should be to encourage fair labour standards, so that countries like the US can compete with developing countries when it comes to labour work and wages. Shrinking the wage gap and working conditions gap will be key to creating a level playing field for all countries and create positive social change. It will be interesting to see what the outcome of these negotiations are and what sort of impact they will have as the demand for fair trade continues to increase globally. Read more: http://www.huffingtonpost.com/joel-richard-paul/fair-wages-for-fair-trade_b_1944379.html.